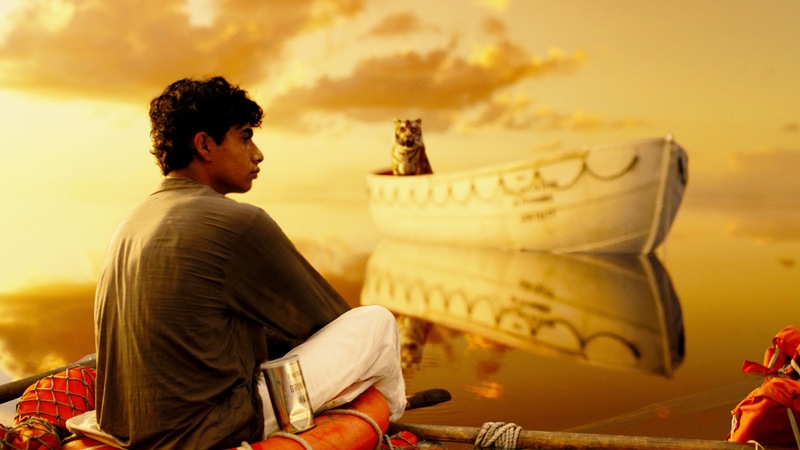 Life of Pi, Ang Lee’s allegorical meditation on survival, struggle, the nature of storytelling and spirituality, is a delicate, dazzling, devastatingly gorgeous, but disappointing film in terms of its dramatic thrust. Visually stunning and completely immersive, the world Lee creates is one of lyrical, haunting beauty, but the movie falls a bit short in terms of emotional involvement, long-lasting impact, and narrative complexity. The fantastical fairytale, adapted by screenwriter David Magee from Yann Martel's award-winning, bestselling novel, drifts for much of its duration, centering on the title character’s staggering two hundred plus days at sea, stranded on a life boat with an adult Bengal tiger incongruously named Richard Parker. The fable is framed by an interview in a now middle-aged Pi’s (Irrfan Kahn) Canadian home. As he tells his story to an unnamed writer (played by Rafe Spall), dreamlike dissolves take us back to his soft-focused, idyllic childhood in Pondicherry, French India. Mychael Danna’s exotic soundtrack and Claudio Miranda’s intimately lush cinematography bring the serene, picturesque location to vibrant, vivid life. This section features some of the most moving, funniest scenes in the movie, as we meet a young Pi, actually Piscine Molitor Patel after a Parisian swimming pool, his older brother and parents, who manage a zoo in the city. This family drama is captured with warmth, wit, and wonder, and the mundane aspects of Life of Pi hold up just as well, if not better, as the majestic. Doubt is useful, he insists. You can’t know the strength of your faith until it’s tested. And Pi’s faith will definitely be tested. Out of economic necessities, his parents decide to sell the zoo, pack up and emigrate to Canada to start a new life. They and their animals board a Japanese cargo ship, which gets wrecked in a storm in the Pacific. A teenage Pi (Suraj Sharma), a zebra, a hyena, an orangutan, and Richard Parker are the only survivors, warily sharing a lifeboat until the laws of nature take over, leaving only Pi and the tiger alive. The rest of the film focuses on their harrowing journey across the ocean and the wondrous, hypnotic sights they come across. The character’s struggle on the high seas provides a lesson in innovation, adaptation and survival. He builds himself a raft, deals with dwindling food and water supplies, and tries to maintain his hope, his sanity, and all his limbs. These scenes aim for verisimilitude, but it is the other, less realistic sequences that make the film worth watching. Taking moviemaking to its furthermost points of technical achievement, the director steeps Life of Pi in a different kind of realism altogether, one that is dreamlike, magical, mystical. The CGI works wonderfully because the whole movie strains our willingness to suspend disbelief and the rules of reality don’t have to apply. The lavish, luscious images Lee creates are overwhelming, filled with surprise and grandeur. For all the weaknesses of the story, the film is a wonder of impeccable artistry. 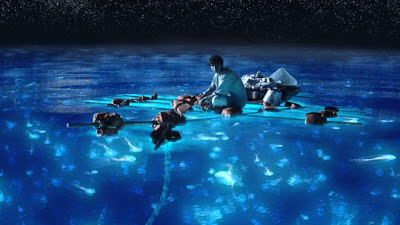 Lee’s visual mastery is what saves Life of Pi from its indulgence in glib, vague notions of deep questions about faith and humanity, and you don’t have to buy its religious pondering—I didn’t—to find yourself lost in its breathtaking beauty. The otherworldly images will stay with you long after the narrative has faded from memory. Single isolated shots form moments of eerie, haunting poetry: the ship’s lights disappearing into darkness as it descends the abyss of the sea; a surprisingly acrobatic, immense, phosphorescent whale surging skyward in the night; luminescent fish lighting up the black waters brighter than the stars above; the boat gliding on the still, smooth surface which reflects the peach golden sky like glass; and, atop a floating island, enough meerkats to turn into a shifting, shuffling gilded field. For a book that had been deemed unfilmable, Lee certainly does a great job, making it hard to imagine this striking story told through anything other than a visual medium like the movies. Despite the film’s artifice through special effects and digital extravaganza, it revels in the glorious, poignant imagery of the natural world. Lee refuses to use his technical, three-dimensional possibilities as a gimmick. Things don’t lurch and lunge at the camera; the director opts instead for an almost classical stillness, smooth cuts, and relatively long takes which ground the film, giving us time to take in its bold, graceful compositions. Suraj Sharma does an admirable job in his first screen role as the seventeen year old Pi, although he is upstaged both by the tiger and the sea. The ever-reliable, expressive Irrfan Khan, portraying the older version of the character, suggests depths of suffering unexplored by the narrative, and provides a tragic, haunting alternative story. Pi’s ordeal is at one point described as “a story that will make you believe in God.” I’m not so sure about that. Although Life of Pi is colorful and creative, it promises more than it accomplishes. The movie strives for grandeur, but lacks substance.